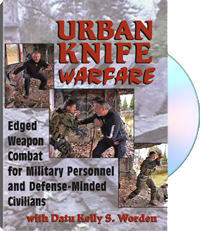 Packed with bleeding-edge military knife techniques designed for real-life combat in the most hazardous situations imaginable, this hard-core video production from Paladin Press brings you Datu Kelly S. Worden's knife-fighting program, originally taught only to U.S. Special Forces troops. Utilizing principles of instinctive movement, instantaneous counterattack and simple arcs and thrusts, Worden focuses on the nitty-gritty of knife fighting, not martial arts dancing useful only in the dojo. Shot on location in one of the most dangerous urban neighborhoods in Washington state, this video will teach you how to maintain your footing in places you're most likely to wind up in a real fight for your life, as well as how to use your environment to put your attacker at grave disadvantage. Worden also teaches control methods with the knife as less-lethal options for defense, as well as one- and two-man restraining techniques previously taught only to military personnel. Then, taking what you've learned with the blade to empty hand, he shows you how to crank up the intensity into the red zone, demonstrating how to disarm a determined attacker and keep him from getting back up again. For information purposes only.